Formulated in a light but creamy texture, this makeup base C-Vit, gives the skin a dose of energy to revitalize the skin. Its formula rich in active principles antioxidants confers a protection to the skin or through their antioxidant action, either by incorporation of sunscreens SPF15, which protect the skin from the harmful effects of UVA and UVB rays. Delivers a radiant, fresh and luminous aspect throughout the day. Available in two shades: clair/light, gold/dark. Apply on clean skin, after the usual daily treatment, by a gentle massage until you get a homogenous distribution of the product. On a daily basis, skin is subjected to several attacks (pollution, tobacco, temperature changes) that combined with an unhealthy lifestyle such as poor diet, lack of sleep and stress, is reflected early on in the face, through one dull skin, no light, no vitality and aged. 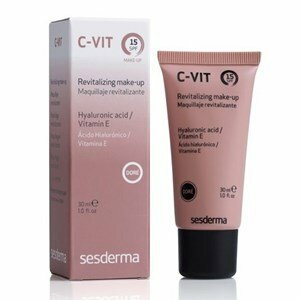 Sesderma solution is the prevention of skin aging through an antioxidant action, with one of the most effective active ingredients: Vitamin C.
C-Vit returns the brightness and lost vitality over time, providing you with a radiant and healthy with immediate effect.